Weerthof – Out Of Control | Esc.rec. Thanks to : Marijn Moerbeek, René Genten, Jyoti Vennix, Harco Rutgers, Yves Brandsma, Amanda Majoor, Marleen de Puydt, Carlijn Stevens, Mark van den Heuvel, Lot Broos & Wietske Vogels. Ingredients : Accordeon, Autoharp, Balloons, Bathtub, Beatboxer, Birds, Carrillon, Cellophane, Chair, Computer, Crystal Glassware, Cuckoo Clock, Cutlery, Daxophone, Digital Alarm, Faucet, Floor, Glycerin, Guiro, Harmonica, Harpsichord, Insedit Olea Redolentia, Kazoo, Lauric Acid, Maple Wood, Maracas, Pendulum Clock, Pentasodium Pentetate, Piano, Polyvinyl Chloride Pipes, Propylene Glycol, Rooster, Rubber Bands, Saxophone, Sewing Machines, Sodium Chloride, Sodium Laurate, Sodium Laureth Sulfate, Sodium Lauryl Sulfate, Sodium Stearate, Sorbitol, Stearic Acid, Tetrasodium Etidronate, Toothbrush, Universal Serial Bus Data Storage Device, Valves, Vibraphone, Violin, Vuvuzela, Water, Whirly Tube, Wooden Ruler, Xylophone. Out of Control contains samples from freesound.org. The Out of Control EP takes you on an electro-acoustic journey through a (not so) ordinary day. Glitchy electronics, neo-classical and unlikely musical instruments such as sewing machines, toothbrushes, daxophones, elastic bands, pvc pipes, balloons, whirly tubes and vuvuzela’s. 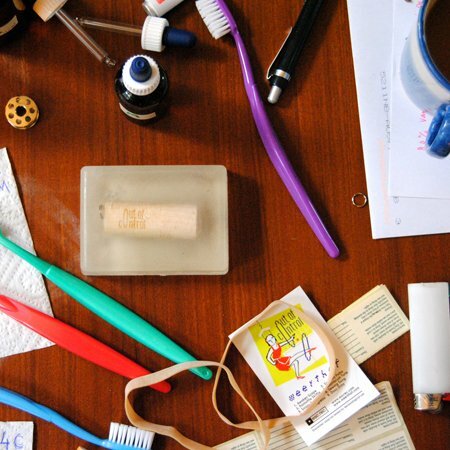 Originally this music is the soundtrack for circustheatre play ‘Huis op Hol’ (previously known as ‘Out of Control’) by Wietske Vogels about a peculiar female inventor who builds overly complicated contraptions to make her everyday routines into something gracefully awesome. This release is available as a pay-what-you-want download, but also as an exceptional limited edition. 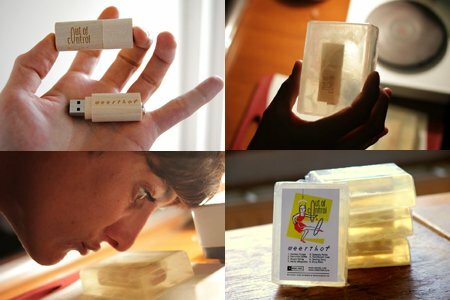 Here it comes… a wooden usb-stick, encased in a bar of soap, home-made by Weerthof! No more vinyl or CD’s clogging up your house if you don’t want to! Only 50 numbered copies of these are made, straight from the Weerthof cooking laboratory. Weerthof is a musician, artist and producer of soundtracks and catchy pop songs hailing from Den Bosch. This is his fifth release, and his first instrumental one in almost 10 years. He seems to have returned a bit to his roots of fusing classical music with IDM, modifying trivial sounds and building objects to create those specific sound combinations. Yet bringing along the exploration of pop and early music from his 2012 album ‘Hoi’, resulting in a light, somewhat eclectic yet distinctly Weerthovian flavour. Photo’s of the EP release in Amsterdam. On the 3voor12 Luisterpaal now!